1" wide strap with drop length of 13"
This gorgeous bag is exactly what you need to add to your accessory collection. And get this: it has genuine leather accents! What could be more beautiful in a good bag!? This bag is made of a sleek, smooth fabric and genuine black leather accents, measuring at 12" W x 10" H x 5" D. You will find leather accents on the zipper closure, strap, and bottom of the bag. There are also four metal feet on the bottom of the bag in order to help it stand up straight. There is nickel hardware accent loops that hold the strap to the purse. The shoulder strap itself is 1" wide and drop off your shoulder about 13". On the inside you will find two slip pockets and a zipper pocket to store small items. There is even a key fob attached to the inside! Go into the design center to start creating the perfect bag. Start with a pattern that you love, then find a graphic, monogram, or saying that matches! If you have any questions about how our design center works, just give us a shout. We are always happy to be of service! Take a peek at our Purse section as well to complete your perfect set of bags. 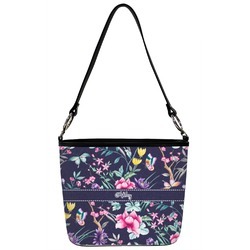 We have everything from crossbody bags to hobo purses to diaper bags. Need a wallet now to go with your bag? You'll find gorgeous zippered wallets as well as small framed wallets that are more compact. All in our Ladies' Wallets section.